Work-Life Balance, Performance and Values | Fourth Dimension Inc.
Work-life balance has become an important issue in the contemporary corporate world. This new need or aspiration emerging in the corporate world raises some ticklish questions on how to integrate it with other corporate goal like performance and company values or goals. This article examines this issue in the form of a case study and in the light of integral management. Sheela Madhur, Director of Human Resources of InfoTech International, did not realise the full significance of work-life balance issues until the conflict between Sachin Gatkar and one of his subordinates was brought to her attention. InfoTech International is an Indian multinational in the IT sector with a global presence in America, Europe, South Africa and South East Asia. Sheela Madhur is aware of the growing importance of the work-life balance issues among the young professional work-force. It cropped up from time to time in the meetings and discussions she had with her colleagues. But it was not a major issue or priority in her agenda, compared to other more important matters like talent or performance management. Sheela thought that work-life balance issues have to be tackled at the departmental level between the boss and the subordinate and not a problem of top management. But the case of Gatkar raised the question in her whether the company needs some common guidelines for dealing with work-life balance. Gatkar is the Manager, New Projects, India at the head office of InfoTech at Mumbai. Rashna, a software engineer and a member of Gatkar’s team asked Gatkar, whether she can work from home on Fridays because she just had her second child. Gatkar agreed because he knew Rashna’s capabilities. She was an eight-year veteran of the company and was one of the most brilliant and productive members of the team. Gatkar believed Rashna’s performance will not suffer if she worked for a day in a week at home. After a week or so, word got around the office that Rashna was working from home on Fridays. Soon, Gatkar was approached by another young team member, Sunil who had been with the company for a year. Gatkar found him to be lacking in motivation and drive and not upto the mark in terms of performance. But he too wanted to work from home on Saturdays because he wanted to perfect his yoga practice. But Gatkar refused. Sunil asked Gatkar: “May I know what is the criterion for accepting Rashna’s request and refusing mine?” Gatkar replied, “First is performance. Rashna is a performer and you are not; second is need, Rashna’s request is based on a genuine need.” But Sunil shot back angrily: “You are imposing your own values on me. You are saying that mothering has more value than yoga. But I am never going to have children. Who are you to say that my yoga is less meaningful to my life than Rashna’s children to her? To me, yoga classes which enhance my wellbeing and help me to grow spiritually is more important than my professional career.” “Sorry, that’s the decision I made,” said bluntly the boss. And Sunil sent an email to Sheela and Ravikiran, the CEO of the company, describing in detail his conversation with his boss and complained that there is no equity, justice and understanding in the decision of his boss. “I never once asked anyone; ‘Is there some place you would rather be—or need to be—for your family or favourite hobby or whatever?’ The idea just didn’t dawn on me that anyone would want to be anywhere but at work. My defense, if there is one, is that those were the times. In the 1960s and ’70s, all my direct reports were men. Many of those men were fathers, and fathers were different then. They did not, by and large, attend ballet recitals on Thursday afternoons or turn down job transfers because they didn’t want to disrupt their kids’ sports ‘careers.’ Most of their wives did not have jobs with their own competing demands. In general, it was assumed that wives stayed at home to make everything run smoothly. Debate about the topic within GE became more intense in the early ’90s, both at Crotonville and during meetings with the GE African American Forum, and it reached a new level of inten­sity later on during my meetings with members of the company’s Women’s Network. The management of InfoTech International must understand clearly this demographic shift in values and attitudes of the new generation and make a conscious attempt to accommodate them in their culture. The personal values of the individuals and the values of the organisation are a major factor in determining the work-life balance choices, priorities and decisions of employees and the managers. It is now recognised that a progressive management or organisation must help its employees to arrive at a workable integration of their personal aims, goal and values with that of the organisation and this is regarded as one of the aims of work-life balance. But for this to happen, there must be a certain amount of harmony between the individual and organisational values. If they are radically opposed to each other, then no integration is possible. 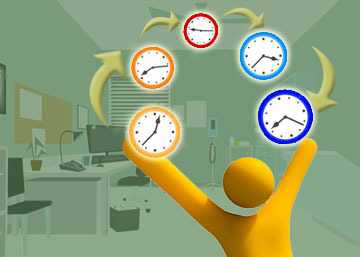 For example if spiritual development and personal wellbeing are high in the value-system of an employee, like Sunil, and the organisation where he works regards performance as the most important value and looks down upon those who pursue spiritual values, which seems to be the case with InfoTech International, then no integration is possible. In such an organisation, managers will simply reject all requests related to the spiritual needs of employees like Sunil. However this is not the only way to resolve work-life balance issues. There may be other organisations which may follow the ideal of equality suggested by Ramesh Tiwari. The management philosophy of such an organisation could be something like this: “Let us give equal opportunity to every employee to arrive at work-life balance, irrespective of performance. If an employee lacks in performance, he will face the consequences in terms of career prospects. But let us not make performance the criterion for work-life balance. Let everyone be given the opportunity to integrate his work and life, which can be a positive factor of motivation.” This type of culture may be neutral to the higher aspiration of employees, but still may provide equal opportunity in the domain of work-life balance. There can also be a still more humane and a higher corporate culture which regards the holistic development of its employee as a core value and favourable to the spiritual needs of its employees. In such a culture Sunil’s request will be granted without any hesitation. This brings us to Joshi’s view that it was the mediocre employee who asks for more work-life balance concessions. There may be an element of truth in it but not entirely true. Managers like Joshi tend to equate lack of performance with mediocrity. But such underperformance could also be due to a mismatch between the nature of the job and the nature and capabilities of the employee. In a more humane and holistic organisational culture, a manager will make use of requests like that of Sunil as an opportunity to understand the employees better. In such an organisation a manager like Gatkar will say to an employee like Sunil, “Look Sunil, I respect your spiritual aspiration but you are asking for this kind of concession too frequently and your performance is not upto the mark” and will enter into a sympathetic dialogue with him to understand the root causes of his behaviour. Banerjee was right in suggesting common and objective guidelines for work-life balance. Such guidelines help to bring objectivity, clarity and fairness to the employees and managers in dealing with work-life balance and linking them to the values of the organisation. It brings clarity to the employees and managers in knowing whether their requests and decisions on work-life balance issues are in harmony with the company’s values and policies. For example a company policy may say, “work-life balance request has to be based on genuine needs. Managers must try to accommodate as much as possible, work-life balance needs of the employees. However managers have to ensure that such concessions go to the most deserving who have earned it by their performance and alignment with company’s goals and values.” This makes it clear to the employees and managers the company’s policies in the domain of work-life balance.